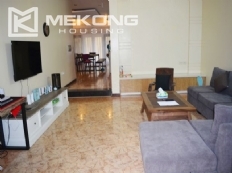 This modern villa is located in quiet area of T block Ciputra Hanoi. The villa has 280 sqm land area and 500 sqm living area with front yard, back yard and nice sidewalk surrounding the villa. 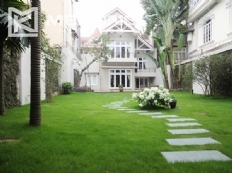 This rental villa is peacefully located in quiet area of T block Ciputra Hanoi. The villa has 230 sqm land area and 500 sqm living area with front yard, back yard and nice sidewalk surrounding the villa. Ciputra Hanoi 5 bedroom villa in the T block with total land area of 300 square meters is for rent now . It is designed with 5 airy bedrooms, 5 bathrooms with modern fittings and a spacious living room and an open kitchen. Total land area is 126 sqm, composed of 3 floors with 4 bedrooms, 4 bathrooms, a living room and kitchen. The rental villa has front yard, back yard, garage, and a surrounded garden. It is airy and bright with many glass windows. This fully furnished villa is composed of 4 bedrooms, 4 bathrooms with walk-in shower and bathtub, a spacious living room, a well equipped kitchen, large balconies with nice view of Ciputra landscape. There is a large living room, modern kitchen, and garage on ground floor, 5 bedrooms and 4 bathrooms with walk-in shower and bathtub as well, a laundry room on roof top floor and many store space. Ciputra Hanoi offers villas in D2 block Ciputra Hanoi located only 15 minutes from Hanoi City center. Each elegant villa has its own front yard, back yard, composed of 5 bedrooms, 4 bathrooms with bathtub and walk-in shower, a bright living room and a well equipped kitchen.